Graduation is a time to honor students for their achievements, and kelly green graduation stoles can be an excellent way to show them your support of their academic successes. The graduation stole is worn on top of a graduation robe by placing the center of the stole behind the neck and then draping the ends over the shoulders. Graduates may wear an honor stole for any number of reasons, whether they are being recognized for their particular merits in a given field, showing their membership in a special club or academic group, or are just trying to express their love for their school. A graduation stole is an excellent way to enhance your students' commencement experience. The kelly green stole offered by Honors Graduation is very bright and uplifting, and looks regal against any standard graduation robe. Some schools use the kelly green graduation stole as a required piece in the commencement uniform, representing school spirit and the graduating class's general achievement. There are also a few honor societies that use a kelly green graduation stole to honor students who have maintained upstanding membership. The kelly green graduation stole is also often used to designate outstanding achievement in the field of medicine. Honor stoles are sometimes replaced by "stoles of gratitude," which the students wear throughout commencement, and then give to a teacher, parent, friend, or other loved one who particularly helped them throughout their educational career. Whether the help was financial, strictly academic, or just emotional support, your students may enjoy having the opportunity to thank those who were most helpful to them. A kelly green graduation stole works very well for this tradition, as students generally write on the back of the stole, and the thick kelly green fabric will prevent the ink from bleeding through. 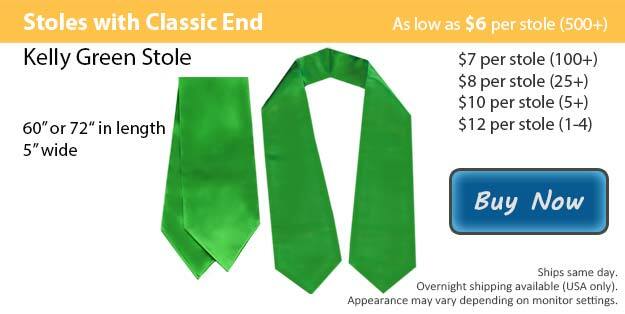 Offer your students a kelly green graduation stole to don at their commencement exercises, whether it be to honor them, or for them to honor someone else. Kelly Green graduation stoles will bring a completeness to your school's commencement ceremony.